Although Flinders Ranges Research is basically concerned with History it does seem to be an opportune time to have a look at what the future is, or will be, holding for South Australia and how it is, or will be, effected by the present global economic crisis. In today's global economy South Australia is still vulnerably. Mining which made South Australia is still very important today and signs are pointing to it becoming even more important to the State's recovery from the world financial troubles. Among some of the problems South Australia has to deal with are its geographic isolation, lack of rainfall and irrigation sources, fewer overseas tourists and students than the other states, relative low population growth and an ageing workforce. However despite these, and other problems the South Australian economy is expected to perform well over the next five year. The South Australian Government Economic Development Board predicts that the state will suffer from the Global Economic Crisis in the short run. On the brighter side though, with the $15-$20 billion expansion of Roxby Downs South Australia will eventually emerge from the crisis as a national economic leader. Much of this due to a large degree by the rise of China and India as the economic power houses of the 21st century. The $8 billion Air War Destroyer Warships project will also provide a welcome boast. In the book State of South Australia the more tan 25 authors have covered many and varied issues which will all affect the recovery and continuing progress of South Australia. Among them are Aboriginal policy, employment, changing population, the environment, health, housing, education, urban development and planning, infrastructure and law and order. They have provided most of the data in easy to read and understand tables and graphs, providing an instant picture of the issue under discussion. The book contains revelations in each of these areas which point to the state's prospects of economic recovery in the context of the global economy. 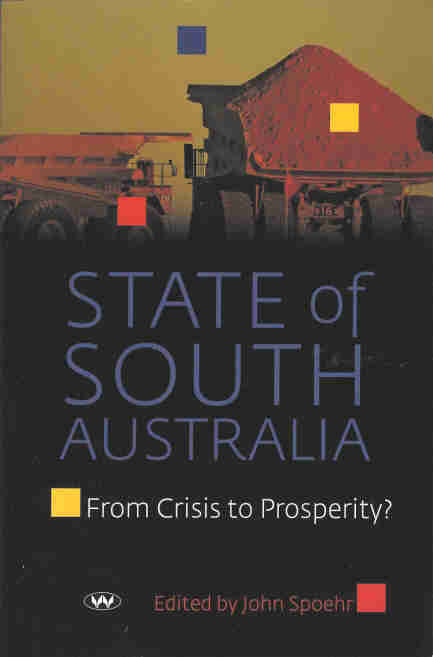 At the same time it offers the most comprehensive analysis of the key challenges facing South Australia. The chapter on Aboriginal Policy is a most disturbing one. A lot of work will have to be done yet to rectify the many disadvantages Aborigines still experience daily. Aborigines even today face significantly worse conditions that the non-Indigenous population across many socio economic measures. They still have a higher rate of unemployment, lower household income, higher rate of suicide, worse health, higher rate of incarceration, higher infant mortality, lower home ownership, higher rates of domestic violence and many more.